The USS Intrepid is an Essex Class aircraft carrier of the United States Navy (USN). She is currently berthed in New York and serves as a museum, but had an operational life in the USN spanning over 20 years. 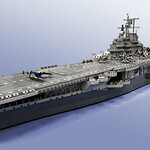 When complete, this model will depict the USS Intrepid as she appeared in February 1945, immediately after her second major refit. The model will be to minifig scale (I have chosen a scale of 1 in 40) making the final model 6.8m or 23ft. I hope you enjoy coming on this voyage with me! What are you doing to me Dr Savelsberg!